Are you looking for a real jungle adventure?? Our 9 Day Sumatra Orangutan and Tiger Trek ight be just what you are looking for! If you really want to see orangutans, monkeys, gibbon, macaques, monitor lizards, birds and other animals in the wild, come on our 9 day Sumatra Orangutan and Tiger Trek near Bukit Lawang for some amazing animal spotting in North Sumatra, including a visit to the orangutan feeding platform. 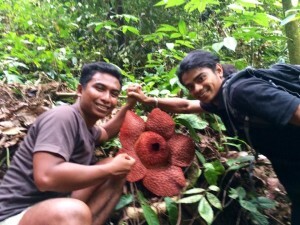 With a cheerful farewell and good luck wishes you will start your trek at the entrance of the Gunung Leuser National Park. First stop is the orangutan feeding platform. Over the next five days you will experience some steep climbs and ascents with the aid of rope and a hand or two from your local guides. You will learn to navigate around tree roots and jungle vine alongside learning some rainforest survival skills from your local guides: path-finding, setting up camp, fishing, foraging for food and medicine, making fires and cooking. The terrain you will be trekking on will be extremely steep, but the views spectacular, with plenty of stops to help you to acclimatise and adjust to the local conditions. Gunung Leuser National Park is mostly mountainous, covering a million hectares, straddling the borders of North Sumatra and Aceh provinces. Tonight will be your first night’s experience in the jungle. You will have time to relax and bathe in the River before your evening dinner. You will be amazed at the delicious food your guides are able to cook up in the middle of the forest! Your tent each night will be a simple bamboo frame, covered with a plastic tarp. 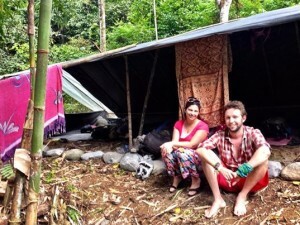 Jungle camp at Adi Black. Day 4. Trek to Camp 2 Batu Gajah Landak River. This morning after breakfast you will start a trek over 5 hours in direction to the Landak River. As you trek deeper into the rainforest, your chances of encountering wildlife increase. The terrain will be steep, but the views will be spectacular. Fantastic scenery along the way through the national park will be then a memorable experience for you. Keep your eyes peeled for orangutans – they are surprisingly tricky to spot! Look for signs that they are nearby, like the nests they build each night, movement in the canopy, broken branches, or calls from other animals. Your guides will point out a variety of wildlife and plant species and you will begin to see the forest through their eyes. Even though sightings of orangutans and other wildlife can never be guaranteed, when following the instructions of your guides the chances are more favourable. 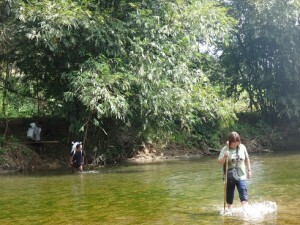 The campsite of the second night will be next to the Landak River where you will arrive around 3 pm. 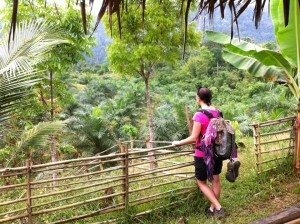 Along the way there is a big chance you will see wild orangutans and black gibbons. Our team will offer you an Indonesian dinner and refreshments before you can dream to the sounds of the nocturnal jungle life. Batu Gajah Landak River Camp. Day 7. Camp 4. Trek to Alur Perak and camp on Bohorok riverbank.Today you trek through the jungle in direction to the Bohorok River for around 4 hours. 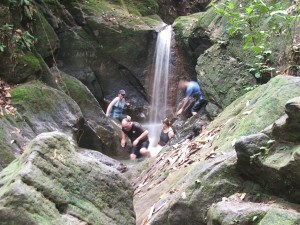 As you trek deeper into the Jungle you will start to feel the real remoteness of your jungle trek. You may wake to hear gibbons whooping in the morning, or the whooshing wings of hornbills overhead. In the afternoon you can relax and swim and try your hand at fishing. 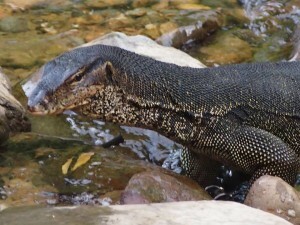 If you are lucky you can observe there the Sumatran monitor lizards, tortoises and colourful river butterflies around the Alur perak campsite. Day 9. Drop to Medan airport. Say goodbye to Bukit Lawang and Sumatra as the guides drive you back to the airport.